Are you looking for major sun protection packed into a light weight anti-aging moisturizer? If so, you might be interested in this review! My Desperately Seeking SPF Sunscreen Review Series continues with Algenist's New Ultra Lightweight UV Defense Fluid SPF 50. As ya'll know, I have been really loving the new Algenist line of products. If you missed those reviews, be sure to check those out here: Algenist Complete Renewal Eye Balm, Algenist Regenerative Anti-Aging Moisturizer, and Algenist's Concentrated Reconstructing Serum. 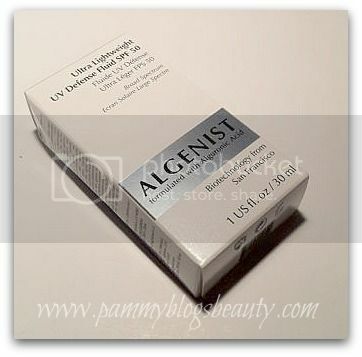 Algenist is Unique: Discover Alguronic Acid! The key ingredient in Algenist's products is a new beauty breakthrough discovery: Alguronic Acid. Algenist's own research claims that Alguronic Acid is more effective than Retinol, Vitamin C, and Hyaluronic Acid! Wow! This is both a bold claim and promising news. There is a lot of potential for skin improvement with Alguronic Acid products! A team of biotechnology scientists in San Francisco, California, focused on developing microalgae-based renewable energy solutions, unexpectedly discovered Alguronic Acid, a powerful compound responsible for regenerating and protecting the microalgae cell. When scientifically tested, Alguronic Acid demonstrated significant anti-aging properties, increasing elastin synthesis by up to 32%* and cellular regeneration by up to 55%*. So, now lets get to my review! You may remember that I felt that Algenist's Regenerative Anti-Aging Moisturizer was just a tad too heavy for my use during the hot summer months? Well, as you can imagine, I was very excited to hear about them coming out with a new lightweight facial sunscreen! How perfect for summer! Keep reading after the jump to find out more about Algenist's new Ultra Lightweight UV Defense Fluid! This is a lightweight lotion with mega SPF protection. Sunscreens combine with the powerhouse Alguronic Acid and antioxidant-rich botanicals to give your skin added benefits.The formula is very sheer and does not leave you looking or feeling greasy. This product feels so smooth and silky going on. It spreads nicely. But, work quickly when applying as it absorbs super fast. It gives a semi-dewy finish and provides a really nice base for makeup. But, depending on your skin type, you might need some additional moisturizer (see below). There is no discernible scent. Also, while actives include zinc oxide, there is not a noticeable white cast on my skin (my skin is super fair anyways). But, you might get a backflash from this in photos. How did my skin react? I have been testing this product for over 4 weeks and have not had any issues with clogged pores nor an increase in breakouts. Also, the sunscreens and anti-aging ingredients in this product did not irritate my very sensitive skin. The UV Defense Fluid is extremely thin and non-greasy. It is a white lightweight liquid. It is a bit on the runny side. It spreads remarkably well and absolutely does not leave you feeling greasy. My skin has gone through a lot of changes after having my first baby 6 months ago. Currently, my skin is combo (leaning towards combo-dry in the winter). So, for the summer, I don't want anything too heavy. With that said, I do feel that I need just this slightest bit more moisture than this product provides on its own. But, this product might be enough for you if you have normal or normal-oily skin. Alguronic Acid - increases cell regeneration and elastin synthesis. Shake bottle well. Apply liberally to the entire face in the morning or 15 minutes prior to sun exposure. Reapply at least every 2 hours. $38.00 for 1.0 bottle. Yes, it is expensive. But, you only need a small amount to cover your face. What I really love? 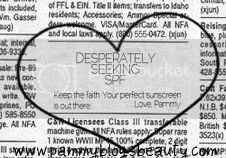 The HIGH SPF! I love that this has a SPF of 50. There are many summer days where I am literally outdoors most of the day (not in direct sun mind you, but still in need of mega sun protection). SPFs above 30 are a must on these type of days. There is no question that this product provides full protection! The added bonus: anti-aging ingredients too! 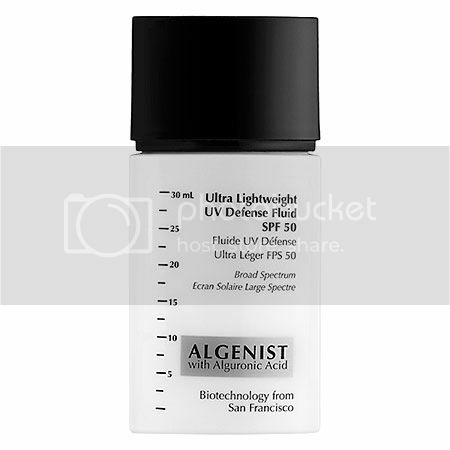 This Ultra Lightweight UV Defense Fluid SPF 50 by Algenist is a great sunscreen for anyone who spends a good amount of time outdoors in the spring or summer months! Also, if you are looking to find an easy way to slip some Alguronic Acid into your everyday routine, this lotion just might be the right choice for you!